Popped in to kill a couple of hours before seeing Kate Bush at the old Odeon. Both staff who served me were very friendly and helped me choose an ale as my preferred pint of Fullers (Discovery) wasn't on. I ended up with a pint of Chiswick Ale which went down nicely. Their pork scratchings were also as good as you can get in a pub short of roasting the hog in front of you. I suppose the scratchings being served in a bowl will only reinforce some views that this isn't a pub, but I think if pork scratchings are served then the place is definitely a pub and I'll choose it over those that don't have them on the snack list. It might not be your favourite type of pub, but its still a good one and head and shoulders above many locally. Chargin �5.25 for a single gin and tonic is indecent. I've had no problems with the place, the service does indeed seem to be good as well as the drink and food, but adamnnavees, I don't see how anyone could sit in The Stonemasons and feel they're in a pub. It's firmly on the restaurant side of that particular divide. I've been coming to this pub for years. It has a great atmosphere, friendly staff, good wine and fantastic mezze platters. My boyfriend and I recently had our engagement party in their upstairs room. There is no charge to hire (bar a token minimum bar spend) and it's a great space. Staff were super efficient to deal with when booking and really helpful on the night. Overall a great little drinking and feeding hole...and apparently they do a mean pub quiz on Wed nights. I don't get these comments about being a restaurant-not-a-pub...this place is definitely both and it combines them brilliantly. We live round the corner and Sandra, Joe and the team look after us locals really well as well as welcoming in all sorts of crowds from the local corporates at the Broadway to residents, and passers-by who like the look of the trendy-but-pubby decor. 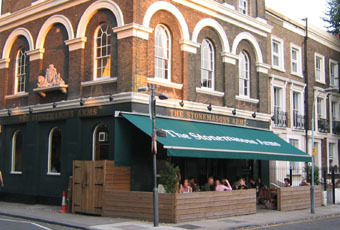 It's a gem - excellent food, brilliant wine list, good range of lagers and well-kept beers. We had a 30th birthday party there on Friday night and it was an EXCELLENT night (though shame about the hangovers on Saturday!) Balloons, champagne, brilliant buffet, birthday cake - all sorted and barely a finger for us to lift except to order the sambucas when it seemed like a good idea!!! I can't recommend this place enough - so good to have a proper local on the doorstep.